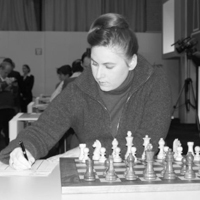 Milan Matulovic was among a leading Yugoslav Grandmasters during the late 60′s and early 70′s. He was Yugoslav champion in 1965 and 1967 and the winner of many international tournaments. Milan Matulovic has represented Yugoslavia at five consecutive Olympiads in period 1964-1972, scoring 4 team medals (2 silver, 2 bronze) and even 3(!) medals for individual results (1 gold, 2 silver). He also played at four European Chess Team Championships (1961-1973), winning 3 team silver medals. His chess career culminated when he was taken to play 8th board in “USSR versus Rest of the World” played on 1970. He was parried to play against former world champion Mikhail Botvinnik. Matulovic lost one game and drew the other three. 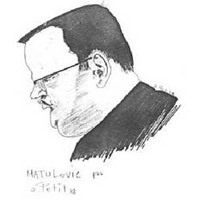 Milan Matulovic was a good chess player. He even played a friendly match with 15-years old Bobby Fischer when he was visiting Belgrade in 1958. Fischer won two, Matulovic one and one game ended draw. However the story of Milan deserves to be in the anecdotes section becase of his scandalous behavior on and outside the board. Matulovic was known for playing lost positions for a long time hoping to reach adjourment after the 40th move. He also has a long history of clashing with his teammates in Chess Club “Partizan”, Belgrade. Sometimes things heated up so much, that on several occasions he threw out his roommates during competitions. The most emblematic event for Matulovic happened at the Sousse Interzonal in 1967. He took a move back in game against Istvan Bilek after saying ““j’adoube”. Bilek was shocked with the courage of Milan Matulovic, and even though many observers witnessed the incident, the arbiter didn’t see the takeback and allowed Matulovic to proceed the game. This earned him the nickname “J’adoubovic”. And who said that chess could be as boring as bingo. The norms of chess say that if a piece is touched during a game, it should be moved (except for the cases where the player applies the jadoube rule). It is impossible to imagine a take back on a GM level. However, it has happened on several ocasions, as the interesting Milan Matulovic Jadoubovic case. Probably the biggest precedent in history happened in the Linares tournament in 1994. Garry Kasparov took a move back in his game against Judit Polgar. Except Judit, no one else saw the takeback, but Spanish TV filmed the scene. Kasparov dropped the Knight on c5, lifted hand a bit, then saw he was losing a Rook, took the Knight back to d7 and few seconds later played Nf8. Judit was stunned, looked around for the arbiter but didn’t complain at all. Here is the game, you can see that the mistake on move 37 would have been decisive. This page is dedicated to short funny anecdotes that happend around the chess board. Most of the materials are sent by our fellow readers, so a big thanks goes to all of them. We hope you will enjoy the funny events. For longer stories (as the one about Kasparov or Matulovic) you may want to visit the anecdotes section. A chess player went to buy a chess book from a shop. He picked it up, went to the counter and asked, “Excuse me, how much does the book cost?” The lady at the counter replied, “This one is $150.” The chess player left the book carefully on the counter, said “J’adoube” and quickly went out of the shop.